Chief Justice John Roberts has called on Chief Judge Robert Katzmann of the U.S. Court of Appeals for the Second Circuit to head up an inquiry into sexual harassment complaints against Ninth Circuit Judge Alex Kozinski. 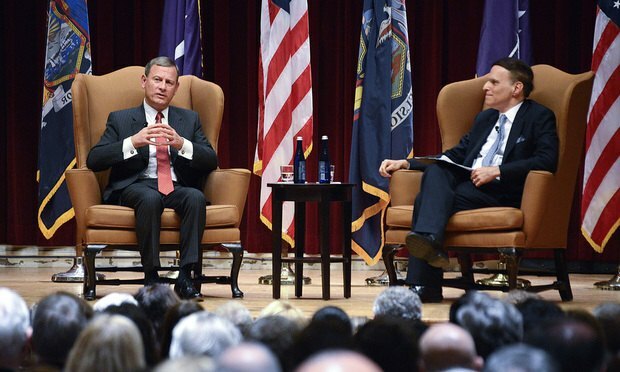 U.S. Supreme Court Chief Justice John Roberts spoke to Second Circuit Chief Judge Robert Katzmann at an event sponsored by The Supreme Court Historical Society and the Historical Society of the New York Courts in 2015. U.S. Supreme Court Chief Justice John Roberts Jr. has routed a formal inquiry into allegations that former Chief Judge Alex Kozinski sexually harassed former clerks and externs to Chief Judge Robert Katzmann of the U.S. Court of Appeals for the Second Circuit.